Winter is finally here in the UK, so it's perfect timing that these two magazines should have free hand creams this month. With Marie Claire, you can pick up four different L'Occitane hand creams (30ml sizes), including one of my all time favourites, the 20% shea butter one for dry skin. 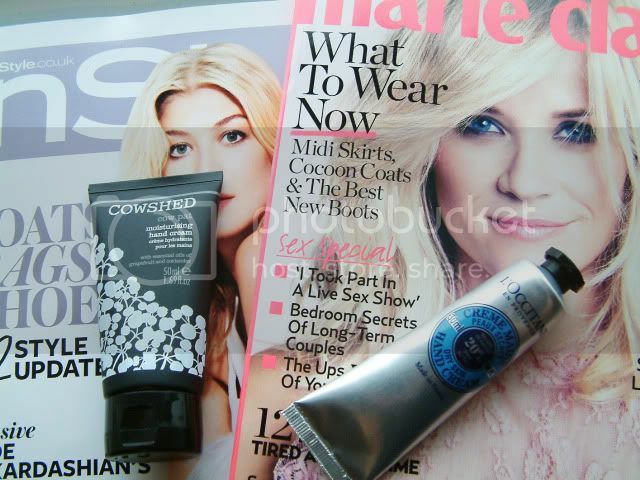 And with InStyle you can choose between two 50ml Cowshed hand creams; I picked up the Moisturising one and it smells good! I LOVE hand creams, as my cuticles get so cracked when my hands are dry! I'll have to pick up Marie Claire for that free L'Occitaine one, I think! That's brilliant, my hands are currently so dry and looking rather manly :/ definitely gonna pick up the Marie Claire magazine tomorrow. I really like your posts on the magazine freebies, something I usually forget to look out for! Ooh thanks for that, i'll definitely be getting the L'Occitane one, love it.